This entry was posted on April 16, 2013 by seekraz. It was filed under Cedar Valley Utah, Photos - Outdoors and was tagged with Cedar Fort Utah, Cedar Valley Utah, Mt Timpanogos, tractor in field, Uinta National Forest, Utah County, Utah farming, Utah photography, Wasatch Mountains. 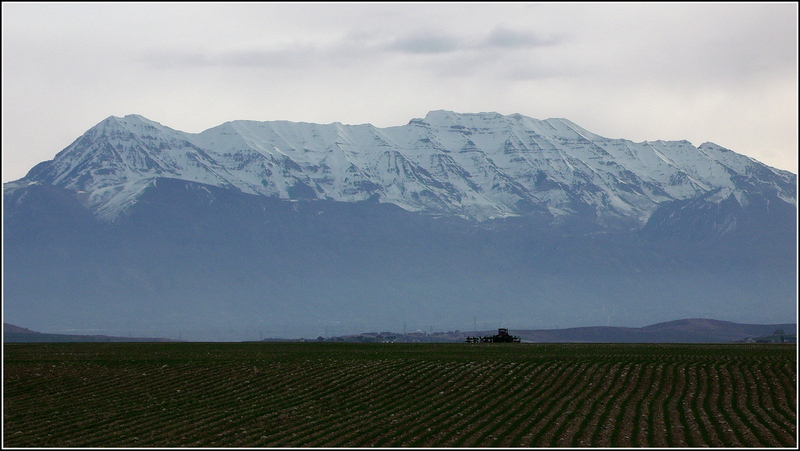 How do they irrigate in Utah? I always think of it as a hot, dry place. Is there plenty of water or do they ration it? I’ve seen many places that have the huge irrigation sprinklers out here…but haven’t seen the canals next to fields like I used to see in Ariz….. I’ve read that water is harvested from the snow-melt as it comes down from the mountains, but don’t really know specifics…and have not heard anything about rationing the water, either, in my almost three years here…. I find agricultural fields and orchards very romantic. There is something heroic about the way the farmer brings food to our tables, even with the help of technology, and when the work covers huge areas. I can spend a long time contemplating such fields. This is quite a picture, with those great mountains in the background. I like the way you see it, Shimon…I hadn’t considered those notions about the agricultural way of life…but they certainly apply. Thank you for your insight and kind words…and yes, such great mountains there…..
Beautiful shot! I love the contrast between the field and the mountain. Here in NH we have a lot of mountains, but they blend with the landscape, not spring from it.